Although some used words such as “uncertainty” to characterize both the mood in Davos and the global outlook for 2019, here at Energy Web Foundation we came away with a different conclusion: optimism, coupled with emboldened confidence in blockchain’s important role to enable and accelerate the global energy transition toward a digitalized, decentralized, and decarbonized electricity system. A number of topics took center stage, from political and economic instability, to trade tensions, the plight of refugees, to varying visions for the future of work. But one topic in particular “dominated the discussions,” according to a WEF recap of the event: the severity and urgency of climate change. When it comes to blockchain in the energy sector, those “users” include utilities, grid operators, renewable energy companies, software developers, and a long list of others. 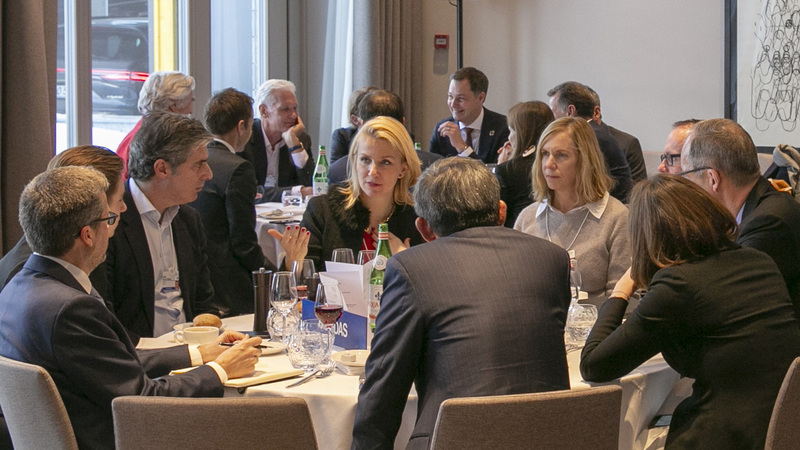 Nearly 100 of them are counted as Affiliates of EWF, and a number were also in attendance at Davos, including Centrica, Engie, Iberdrola, Shell, and Siemens. As the Energy Web Chain moves closer to genesis block later this year, that robust ecosystem represents the users that will truly bring blockchain into the energy sector’s mainstream. A closely related theme also rose to the top during Davos: that of open-source software and its role in technology innovation. “The best developers want to use the best technology, and today, the best technology is open source,” said venture capitalist Jacob Jofe in an interview with Forbes contributor Peter High. In short, companies are leveraging the open-source code domain to prompt faster, better digital innovation than any single company could achieve in traditional, siloed approaches. That, in fact, is a founding principle of the Energy Web Chain, whose core tech blockchain base layer and supporting software modules like those of EW Origin have purposefully been developed as open-source, to speed adoption and innovation among EWF Affiliates and the broader energy blockchain ecosystem embracing this nascent but fast-maturing technology. Another EWF council member in attendance at Davos was Ana Trbovich, PhD, COO of Grid Singularity and an invited speaker on two panels. Grid Singularity had special recognition at this year’s WEF, since it was bestowed the prestigious title of being a Technology Pioneer in 2018 for “the design, development and deployment of new technologies and innovations [that] are poised to have a significant impact on business and society.” That includes the Grid Singularity team’s work both supporting the Energy Web Chain and continuing development of the D3A model for decentralized, transactive energy markets. That vision feels clearer than ever. And perhaps more importantly, that vision feels more attainable and within reach than ever, as EWF, co-founders Rocky Mountain Institute and Grid Singularity, the growing Affiliate ecosystem, and the broader market realize the potential inherent in blockchain and now seize it to usher in a digitalized, decentralized, decarbonized energy future. Peter Bronski (peter.bronski@energyweb.org) is director of marketing and communications for Energy Web Foundation.